"41MR12, Burial I, 77" by Timothy K. Perttula and Robert Z. Selden Jr. VESSEL FORM: Jar with four peaked rims and four strap handles (under each rim peak). The rim is everted, with a rounded lip. DECORATION: There are closely-spaced vertical incised lines on the rim and strap handles. Above the vertical incised lines is a single row of tool punctations under the lip, and a second row—at the rim-body juncture—below the incised lines. The body has an appliqued decoration consisting of two alternating sets of appliqued diamonds and interlocking scrolls. There is a small appliqued node in the middle of the appliqued diamond element. 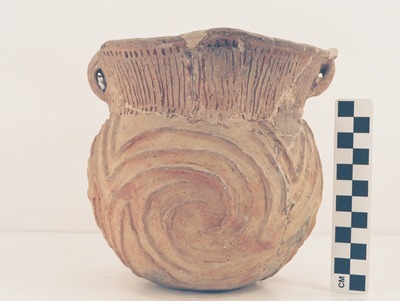 Harleton Appliqued jar (MR12-77) from Burial I at the Ben McKinney site.